The challenge with meetings in general is that the average employee spends so much time in them—time that pulls them away from their regular job duties, potentially hindering productivity. This is why there’s been such a push recently to make every meeting count, regardless of its size or agenda. Wasteful meetings only cost your organization productivity and drain employee morale. In fact, multiple studies have found that the effectiveness of meetings is closely related to employees’ overall job satisfaction. But, of course, effective meetings can be wonderful tools for increasing communication and transparency. Especially when you’re organizing meetings for a large group, perhaps a department or the entire company, it’s important not to let it become a tedious one-way lecture from leaders to staff. It’s also important to avoid becoming stuck in the weeds, surpassing a reasonable time limit because the conversation gets convoluted with many voices vying for airtime. Here’s more on how to run more effective meetings for large groups—helping attendees get the most out of each session and organizations maximize productivity. Everyone should know why they’re attending a given meeting before even entering the room. Large meetings pull lots of people away from their desks, so there should always be a clear purpose for holding each one. It’s simply inefficient to host an unstructured departmental “check in” meeting once a month. Running an all-hands meeting each quarter just for the sake of it is an expensive way to waste time. By setting attendees’ expectations ahead of time, you’ll help them get the most value from each session. If it helps to get people on the same page right off the bat, consider sending out relevant materials ahead of time for people to pre-read at their own pace. Publicize an agenda ahead of time and stick to the time limits set throughout. One of the foremost challenges associated with large meetings is the sheer number of people involved. It may not be possible for everyone to have their turn in the spotlight—that is, if you want the meeting to last fewer than three hours! And yet it’s important to foster collaborative spirit and help participants feel involved in the proceedings. Something as simple as playing interactive presentation games as a large team can help attendees feel more part of a collective, while allowing them to contribute their input throughout. With an audience response system like Poll Everywhere, any number of participants can use their mobile devices to answer questions in real time for trivia contests and more. Every effective meeting results in a list of action items—the deliverables people must produce to meet the objectives you just talked about. Whereas in a smaller meeting you can assign action items individually, larger meetings make it trickier to do so. Instead of trying to go around the room and discuss individual responsibilities, consider compiling a follow-up plan. This way, people have access to a written record and can simply find their names whenever they need to refresh their memories. Names of people responsible for them. Due dates for these action items. 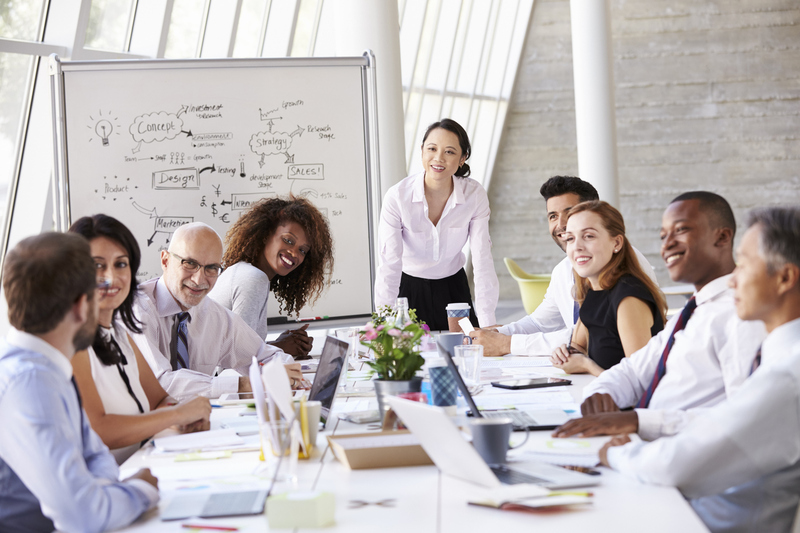 Figuring out how to run effective meetings for large groups is key to any organization’s bottom line, since time is money.